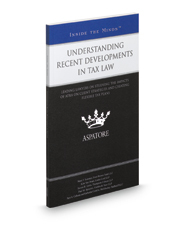 Understanding Recent Developments in Tax Law provides an authoritative, insider's perspective on developing tax strategies in the wake of American Taxpayer Relief Act of 2012 (ATRA 2012). Experienced partners from law firms across the nation analyze trends in rate changes for individuals and corporations and identify potential problems in existing tax plans. These top lawyers offer advice on helping clients gain advantages through gifts, keeping abreast of jurisdictional laws, and understanding the penalty differences among businesses, including S corporations and partnerships. Covering a range of topics from maintaining flexibility in tax strategies to monitoring the shifts in exemption amounts, these experts stress the need to remain mindful of a client's goals while planning, and discuss the effects of recent legislation on taxpayers of all incomes. The different niches represented and the breadth of perspectives presented enable readers to get inside some of the great legal minds of today, as these experienced lawyers offer up their thoughts on the keys to success within this evolving legal field.